This is a guide to using the program MMSSTV. SSTV is most common on the HF bands but is sometimes used on 2m (ISS SSTV events) and other bands. For help on receiving Satellite signals, see here. 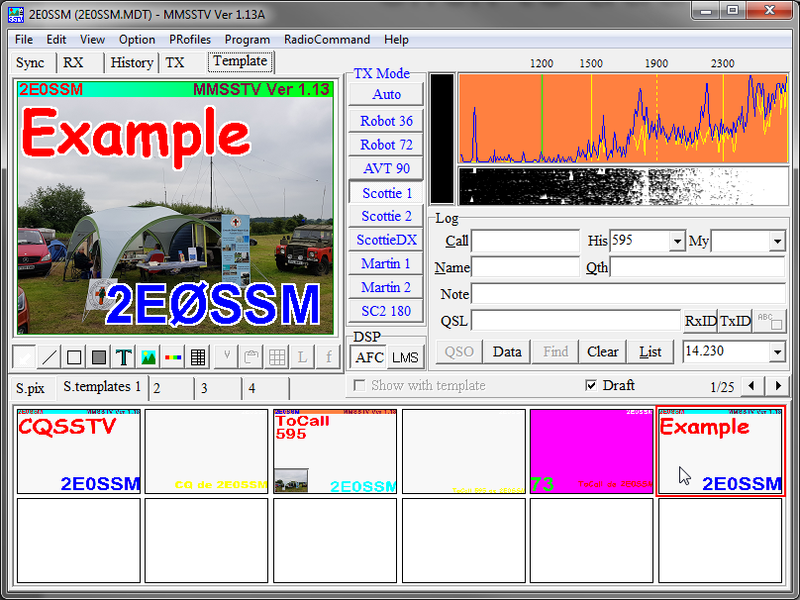 Below is a selection of SSTV recordings (from VE5KC) which you can test decoding with MMSSTV by setting the audio input, discussed below, to a microphone, by using a Virtual Audio Cable or the stereo mix of your sound card. MMSSTV is a popular piece of software used for the sending and receiving of SSTV. For a simple receive setup all you need to do is connect the headphone out of your radio to the input (mic or line) of your PC. For transmission you can get a dedicated data modes cable etc.. made specific for you radio. Or, you can build you own cable like me, which connects from your headphone out of your PC to the Microphone socket on your radio. The PTT can then be done using VOX or CAT control. This is the main MMSSTV window. From here you can access all the controls and settings required to use the software. Firstly the Audio input and output needs to be setup. On the Misc tab select the appropriate in and out sound cards. In will be the audio from your radio INTO your PC. 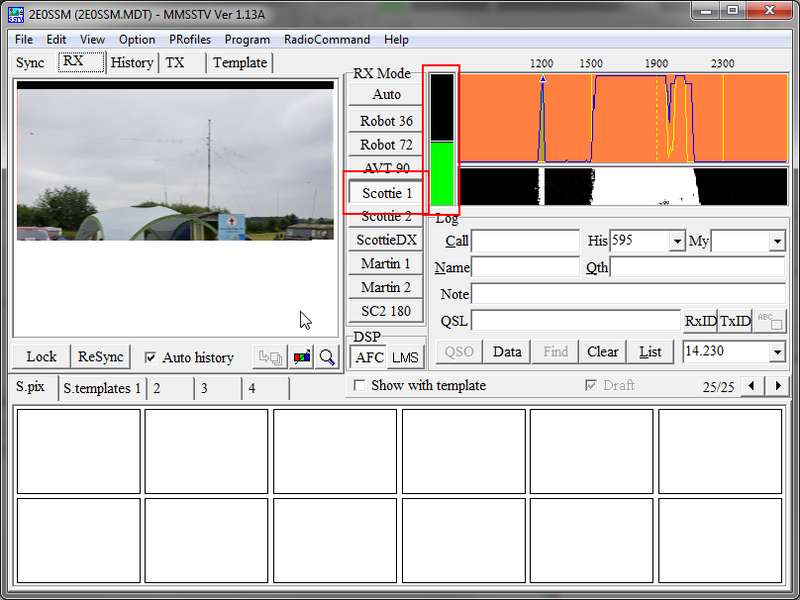 If you are wanting to TX from MMSSTV then you can setup the PTT control on the TX tab if you want to control this from the software. Remember you can also use VOX if your radio does not support PC control. If you are using VOX then set this to NONE. Also on this tab you should set your Call Sign in the top right box. This will ensure that your call will show when creating templates later. You can change other settings here which will be specific to your needs / preference. 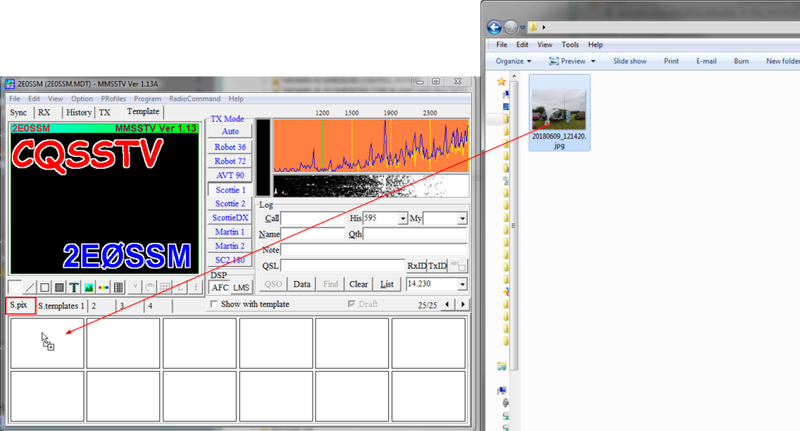 EG, the CW section, when the setting is turned on it will transmit your call sign in CW after the image has been sent. 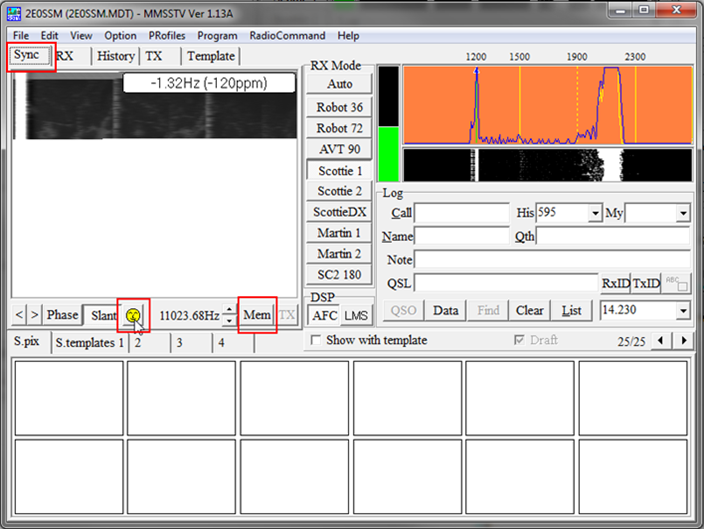 Now you have your audio setup you can start to recieve and decode images. Firstly tune your radio to one of the above frequencies and, on the RX tab of the main MMSSTV window, set the receive mode to ‘Auto’. You then need to set the input volume level to an appropriate value. You should do this by adjusting the volume control on your radio or data interface. 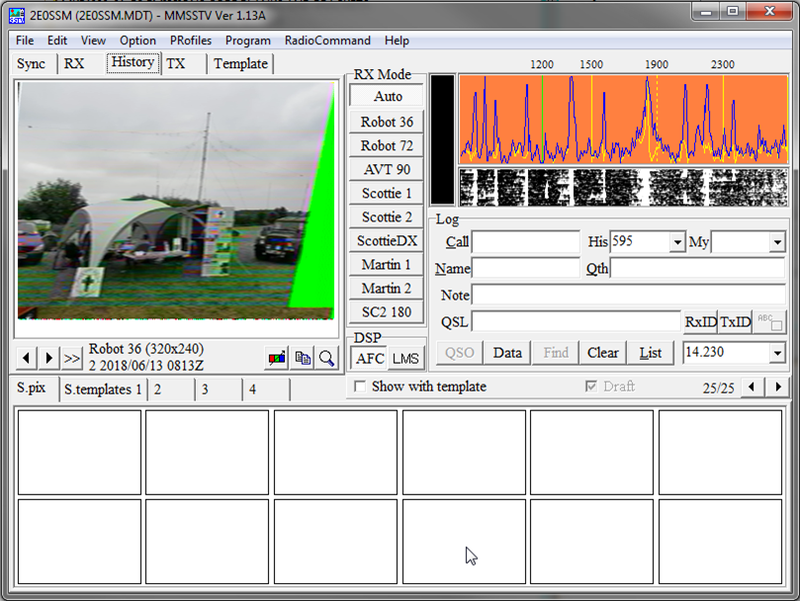 SSTV image being received in Scottie 1 Mode. When receiving an image you should set the volume level to that shown in the image above. The bar will go green when receiving an image. Red if the volume level is too high and gray if no image is being received. 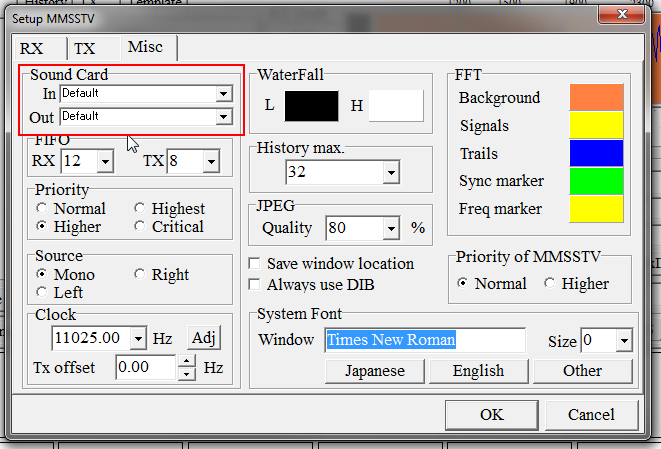 If image appears Slanted this mean you need to correct the ‘Clock’ settings of your sound card in this software. This is because sound cards do not always run at there advertised speed, they could be slightly faster or slower then the software expects. This then creates the slanted image you see below. 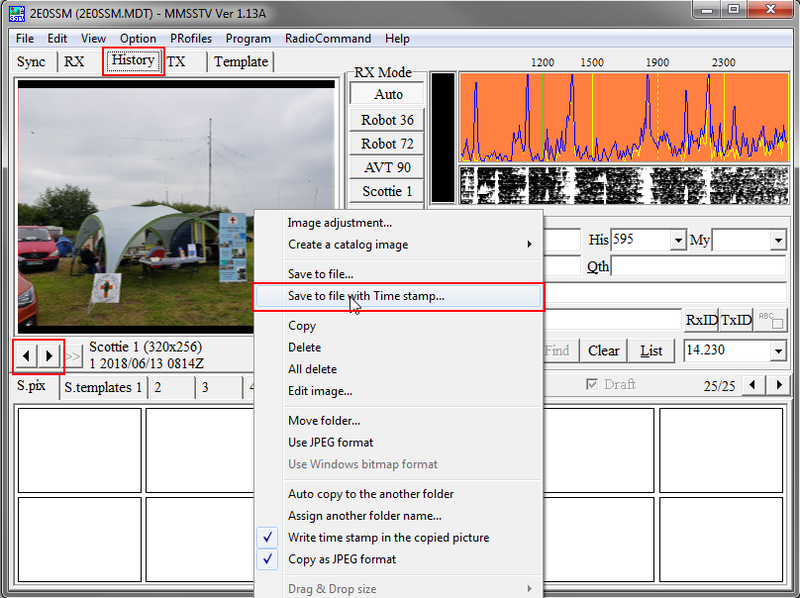 Correcting this setting is easy in MMSSTV. If you are receiving an image from someone who you know has there ‘clock’ speed set correctly for their TX then this is even better. Sometimes you will have to correct this for each image received as not everyone will of corrected their settings. To do this, all you need to do is go to the ‘Sync’ tab and click on the picture of a face. This should then correct the slanted image in the window above. You can then click the ‘Mem’ button and this will save this corrected value into the software settings. For future images you can just click the face each time, the slant shouldn’t be too bad as you saved an initial setting into the settings with the first image. Received images can be save externally from the program for future use. Go to the history tab and on each image you want to save, right click, and select one of the two save options. with time stamp adds a received time / date overlay to the image. Transmitting a picture is just as easy as receiving. You can also customize your transmitted picture however you like. On the ‘Template’ tab, at the bottom half of the window click on the ‘S.pix’ tab and drag onto each square the different background images you would like to transmit. Then in the preview window above click on any of the pieces of text to edit its content, colour, size etc.. you can also use a ‘macro’ which will automatically fill in with the other persons call sign etc.. when using the log book feature. Once you are happy with your layout click on the ‘S.Templates’ tab in the bottom half of the screen. Then click anywhere in the preview window and drag and drop into one of the blank squares. To overwrite an existing template by just dragging to one which already has one saved in it. You can switch between each of the templates and background images by just double clicking on the relevant square. You can choose any combination of template and background image. 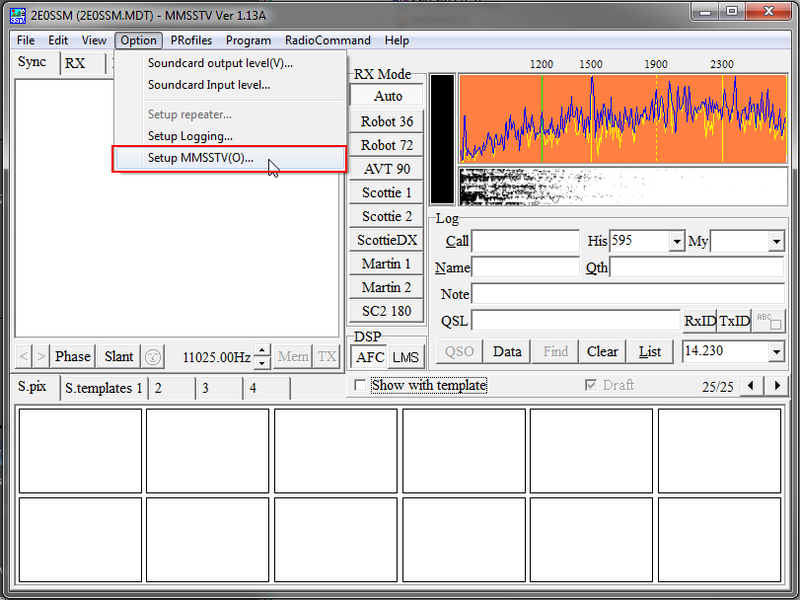 Before transmitting the first thing to do is to get the volume set correctly. If using a direct cable from the headphone socket to the radio then in your computer task tray, turn the volume down to 0 before your first transmission. You then need to select the mode you want to use, select which template and background image you want to send and then click TX. Then you need to slowly turn the volume up in the system tray so that the audio level into the radio DOES NOT show any ALC activity. 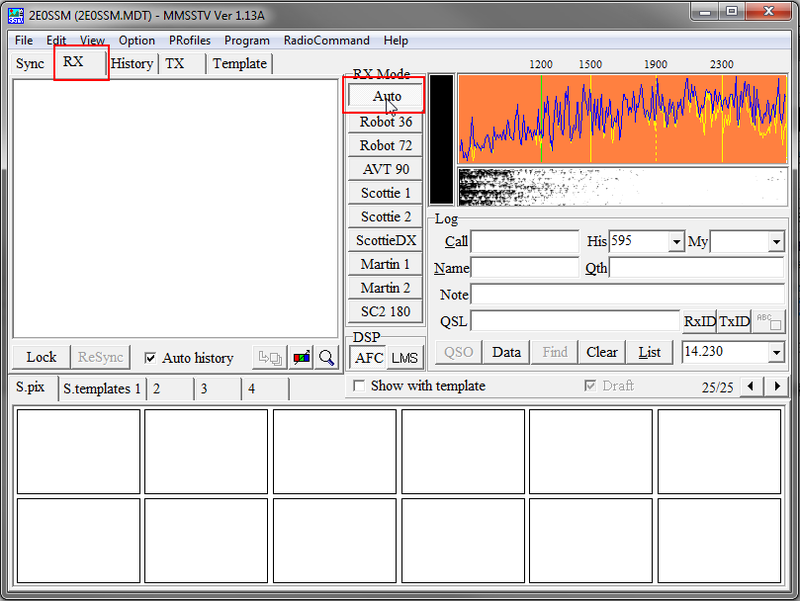 If ALC is active it could distort the signal making it difficult to decode at the other end. 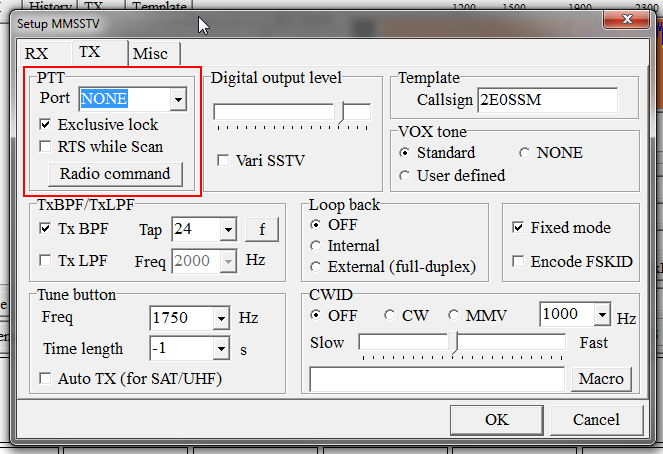 Next to the TX button is the option for a 1750hz tone and the button to turn off / on the CW call sign beacon after the image has been transmitted as mentioned above in the settings section.